PLEASE NOTE: Due to the new EU Digital Download VAT rules introduced on 1st Jan 2015 and PAYPAL's new TERMS AND CONDITIONS on Copyright this is NO LONGER available to purchase as a Digital Download. Until an alternative solution is found if you would like to send a donation by cheque (Min � payable to "J.Wells" and include your email address and I will personnally email you direct to thank you and include the .d64 game for free. Please send to Mr J Wells, 38 Hall Road, Clenchwarton, King's Lynn. Norfolk. PE34 4AT. 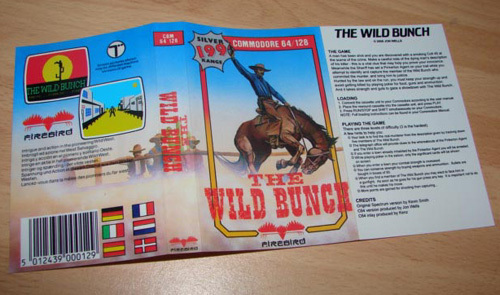 The Wild Bunch is also available as a one-off Special Limited Edition tape for the Commodore 64. There is also a Disk version courtesy of Psytronik Software. To order your copy on Tape or Disk please click HERE to visit the Binaryzone Retrostore. It was back in Nov 1987 when I got mitts on a shiny new C64! Having been a Classic on the good old Spectrum (which I also owned) and Amstrad, and a firm favourite of mine, I was very surprised when I found that Firebird hadn't made a C64 version! By early 1988 I was increasingly getting more interested in the programming side of things and so started to learn 64 Basic. What with The Wild Bunch being mostly written in Basic I quickly decided to do my own conversion as a sort of pet project and learning curve. Having acquired the full Spectrum Basic listing of the game it placed me in good stead to undertake what was then a mammoth task. I learned a lot during the conversion, but unfortunately I could'nt finish it as I needed Assembly experience to handle the Gunfight bitmap sequence and music. Also, around then I had limited time due to starting college and also getting contract work with Cult/D+H Games. Around the time the work was put on hold (mid 1988) The Wild Bunch project was completed to around 80% and fully playable. 20 years later, following an email from Frank Gasking of GTW regarding the project and after finding the lost disks with my original conversion work on, The Wild Bunch Commodore 64 conversion was resurrected and completed once and for all! The official release date was the 23rd of October 2009 and is still available for �99 via digital download purchase! So why not click and buy a copy today pardners! I've been toying with the idea of doing The Wild Bunch conversion for PC / Mac, iPhone and iPad. The first version would be a straight port using the C64 graphics and music I created. This would run on those platforms without the need for a C64 emulator. I'm just wondering if any of you out there would like to see something like this? It's been a while since I've added a bit of news on here, but I've removed the paypal button due to their Terms of service agreement which attempt to take ownership of copyright. At present you can buy the game in physical form from Kenz still via his Retro Store HERE. I'm personally emailing anyone who donates to this website via cheque or through paypal a free copy of The Wild Bunch .d64 image to play on emulators. I'm back from my holiday to find out a few bugs have slipped through into the final game. The worst one being an Illegal Quantity error. It occurs on all selection screens where the choice is numbered only. To avoid it press the numbered key choice that is available only and don't press any other keys. Please note this bug does *NOT* occur in the Journey, Shoot Out, Poker, Store, Map selection and Sheriff's office sequences. I have fixed this and the other minor bugs in the poker game for the disk version so it will be shipped without the bugs. Those of you who have ordered the TAPE and DOWNLOAD version will be receiving a free Digital Download update very soon with these all fixed. Now restart the game by typing in RUN and it won't crash from then on. All the games have now been shipped, check out my final diary entry for more details. They're here! A box load of The Wild Bunch has arrived all duplicated ready for me to package up and post! Check out the new diary entry for more details and pictures. The official release date has been announced for the 23rd of October 2009. Also, a Digital Download version can now be purchased from this site for �99. Finally I've added some more diary updates. The Pre-Order Competition results are in and the Winners have been announced, Yeeehaaaw! 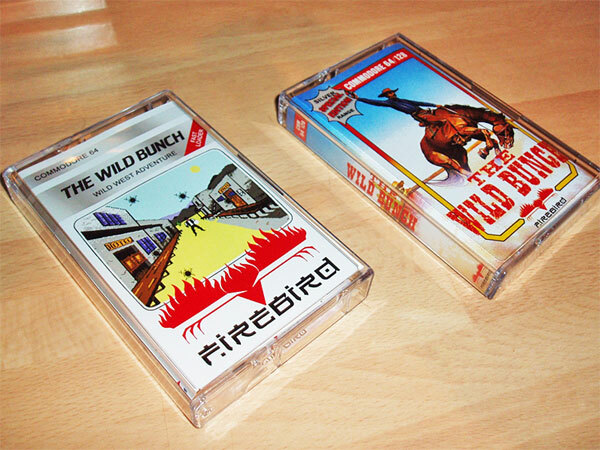 The Wild Bunch is to be also released on Disk via Psytronik and sold in the BinaryZone Retrostore alongside the authentic collectors edition on tape and a digital download version will be made available soon on this website for �99 for those of you who don't have a C64, but want to play the game on Emulators. More diary updates and the game is finally 100% complete and going through extensive playtesting. Kenz's latest diary updates have been added covering the packaging and duplication progress. The pre-order competition closes on Friday 11th of September by 11:59:59pm. Any Pre-Orders after this date will not be entered into the CD competition. We're finally get there... A lot has been achieved over the last 3 months and now that it's 98% complete the official release date will be announced very soon. It's taken longer than I'd hoped due to work commitments, but nothing will be stopping this project from finally becoming a reality. I've added more diary updates and a newsletter form for anyone wanting the latest news on the official release. New multiple month diary entries added by me and Kenz! Me and Kenz will be attending the Retro Fusion '08 event on the 19th of July and we'll be showing a playable demo of the game so far with the authentic packaging to boot. Also, new diary entries have been added! New diary entries added. Check out what Kenz has been upto over the last few months in KENZ's diary. 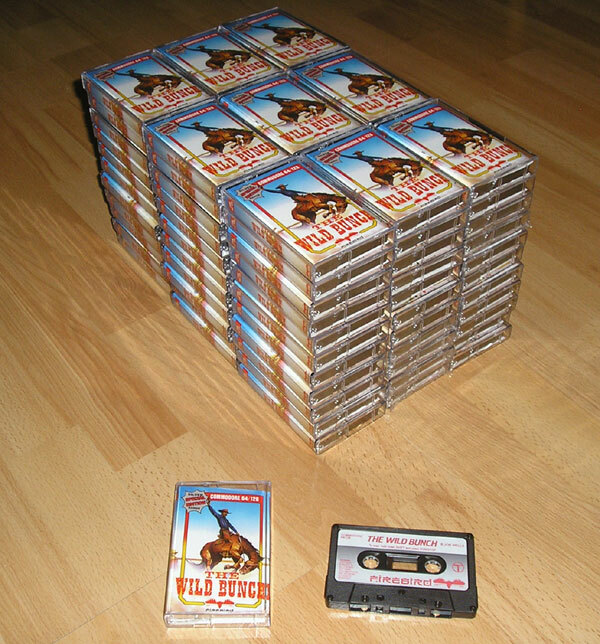 To encourage more pre-orders for the professional C64 Limited Edition duplication run, Kenz has produced 20 commercial quality soundtrack audio CD's for The Wild Bunch Competition. This competition offer is exclusive to pre-order customers only. Check out the competition details in the ordering section. To be in with a chance to win this great prize and guarantee your limited edition C64 tape version of The Wild Bunch, pre-order early! Good Luck!! New Title and in-game music composed, check out my diary entries! The Gunfight street scene is completed! Check out my diary below for screenshots! Work has started on the Gunfight street scene today, keep an eye on the diary over the next few days as I'll be attempting to complete this scene over the weekend! The Wild Bunch Loading screen is complete. See my Diary entry for more details! 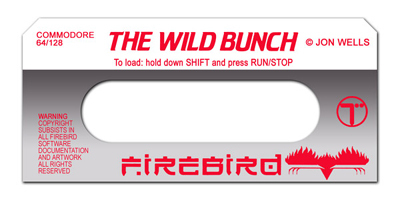 The Wild Bunch has now been made available for overseas pre-orders. I Have also added Kenz's Diary entries in a new section below. Kenz to contribute to the project! Following a few emails to my buddy and all round C64 hero Jason 'Kenz' Mackenzie of Binary Zone, BIT Live and BITS fame he has agreed to contribute to the project! He will be helping in various areas and designing the full colour inlay and label packaging using the original Spectrum's into a fully authentic Commodore 64 version! Our intention is to produce a one-off special limited edition small duplication run on tape with full colour authentic packaging for Commodore 64 collectors. 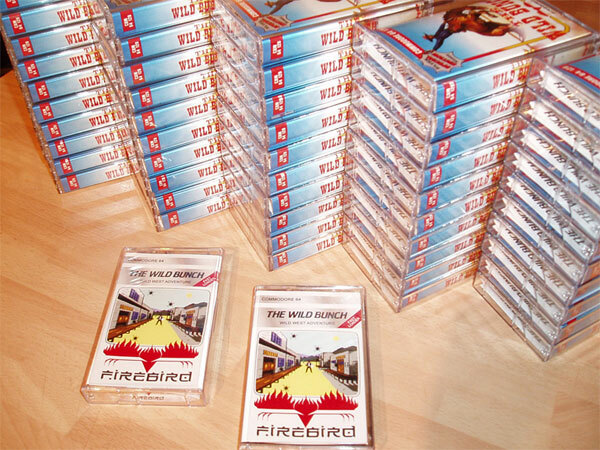 These will be closely based on the original Firebird Spectrum & Amstrad packaging to make it as authentic as possible. Over the weekend I gradually progressed through the rest of the packing, and managed to get everything ready by Sunday, PHEW! I posted them this morning, before I started work. Oh dear, because of the much smaller cardboard mailers, with slightly thicker card this made them slightly thicker than 2.5cm, so it cost me more to post than the others that were 3 times bigger, heavier and had a CD and a tape in! Aaaargggh! How dumb is that, all because of the thickness of each parcel and Royal Mail! I had no choice but to send a lot of them second class in order to keep them as near to the postage cost as possible! Anyway, on a positive note they are all on their way and should be with you very soon! I also emailed everyone their Digital Download version during my lunch break so those of you who are waiting for their copy to arrive can start enjoying the game in the meantime. We (me and Kenz) hope you enjoy the game as much as we have had in creating it! I just want to take this opportunity to thank you all for being so patient and for your support during this project, it would be great to work on something else for you in the future, so keep your eyes on my main page www.gamesplaygames.co.uk for any news or banners that I'll add if I start a new project. Finally, I know it's a little premature, but have a very Merry Christmas and a Happy 2010! I packaged up the first wave of orders (all the winners), on Thursday evening and posted them on Friday. Thankfully Kenz had pointed me in the right direction of a company that produces cardboard mailers so I ordered a bundle of them. The Royal Mail size and weight system is very stupid, so actually although the packages are quite big, as long as they are not thicker than 2.5cm then the postage will be just about right. Thankfully this was the case. Yesterday evening I collected a massive parcel from Kenz, it's the final product all duplicated and ready to go. We duplicated 200 altogether, 100 for me and 100 for Kenz to sell on the Binaryzone retro store. It was quite exciting to open that up and see 100 copies of the game all professionally duplicated (see the piccy below). The packaging looks fantastic and the reversible inlay that Kenz came up with is just genius! I tried out one of them on an old C64 that I have and it loads up perfectly without a hitch, awesome stuff! He also sent me the premium disk version, I have to say the packaging on that is superb quality, if any of you fancy the disk version it's definitely worth going to the BinaryZone Retrostore and ordering yourself a copy. You won't be disappointed! I managed to shrinkwrap all the pre-order copies and I've just got to get them all packaged up ready for delivery then I'll be posting them off, something I'll be doing over the next couple of days! Well folks, that's it my job's done! It's been a long haul, but I've really enjoyed bringing this product to you. Kenz has already sent the game off to the tape duplicators so it shouldn't be too long before we start mailing off the pre-orders. We also have all the professionally printed reversible inlays and packaging too, take a look at the pics below which Kenz has kindly sent for us to drool over! After a few more evenings of programming I've now managed to complete the Intro for the Disk version and the whole thing is complete now. Again it has another animated sequence with some great bitmaps by Kenz. I've managed to create an Intro that closely follows the storyline so it works very well! I packaged this off into a .d64 image and emailed it to Kenz, who was dead impressed. Check out a couple of the images below from the intro. Following a few evenings of programming after work I managed to complete the additional separate end sequence for the Psytronik disk version. Unfortunately I cant divulge any information as it'd spoil your fun, what I can say is that it has a nice animated end sequence with bitmapped graphics supplied by Kenz. I'm quite pleased with the finished result! Don't worry if you've pre-ordered on tape you'll get a free digital download that will contain the .D64 disk image so you can still see it using an emulator! Don't forget the game itself has a mini animated end sequence, this is an additional extra to that so this game has two end sequences to enjoy! I received the final tape master via Kenz today, Richard Bayliss took care of that thanks to his excellent experience in C64 loaders. I'm really pleased with it and Kenz will be sending it off to the duplicators any day now! Exciting stuff!!! We'd already decided on a release date earlier this month, but just to confirm the official release date is to be on the 23rd of October 2009. This just happens to be the same date 25 years ago when Firebird released their first silver range! Now we finally have the game completed the next steps over the coming weeks will be sorting out the game for duplicators and announcing an official release date sometime in October which we will announce later this month. If you'd like to be the first to know, why not subscribe to our newsletter where the announcement will be made first. Richard Bayliss has been working on the cassette loader for the game and has been doing a fantastic job! After numerous styles me and Kenz have opted to go with a loading style that the classic Firebird games used during 1984-1985 featuring a multicoloured stripey loader to make it as authentic as possible. There will also be the inclusion of a loading theme while the game is loading. Following playtesting feedback from Kenz I ironed out a few niggles, these were relatively minor so it didn't take long. After I'd done that I spent the rest of today creating the rest of the jingles that will be needed, jingles like the drinking of beer at the bar, the saloon sequence when a stranger enters and the in-game end sequence tracks. I'll be placing these in the game in the next session. Had the day off work today, so galloped on with The Wild Bunch development. I implemented the new music into the game and tweaked the wanted poster so the W A N T E D letters are fired onto the screen. Each letter is synchronised with the music track that plays as it starts off with gunfire sounds. Once this was completed I spent the rest of the day going over parts of the Basic source and reworking parts as I'd found some bugs during playtesting. I also added more formulas to bring it even more in line with the Spectrum versions logic. Finally I packaged it off to Kenz for playtesting, hopefully there wont be too many more bugs. The game is now 98% complete, so there's not much left to do now. It won't be long now before we're ready for the duplication and its imminent release, just a few more things to program in first which I'll be taking care of next. This evening I'm going to do some music as there still a few jingles needed for the final game. I spent a couple of hours working on 4 music jingles. The name and level entry, the death march tune for when you get shot in the gunfight sequence and a tension building jingle for the wanted poster. Recreated new sprites for jail and end sequence and recoded these to work in the game. I also made subtle changes to some of the screens in the game to personalise it more for the c64, will do more later. Finally managed to fix the Gunfight sequence bug today, it was due to the switching of the interrupt handler between the transition from Basic to Machine Code. Another gruelling session going over the Basic source today making sure it all ties in to the new source code. I also added in the elements to link in the gunfight within the main Basic source. Everything else appears to work apart from when the gunfight sequence starts and crashes! Doh! Will be looking into this next time. Now I must incorporate all the code into the game itself and spent a good 3 plus hours today bolting in the source code parts into the main game. There's quite a few source code calls in the Basic routine that need to be changed so there's still quite a lot of work needed here before I can actually playtest it. I'll be doing more next time. I managed to complete the animated end sequence after a very long session today. I'll be linking all this code together into the main game over the next few sessions, hopefully! Today I linked up the gunfight sequence to the sample player and got the samples working fully. I also did a bit of work on the animated end sequence, but I'm keeping that under wraps so not to spoil your fun. I spent a short time tweaking the NMI sample player and tested out the new 4Bit samples I've created. They sound pretty good for 3.5k! I've been trying to work out a way to reduce them further without losing too much quality. I have an idea which I'm not sure will work, but is worth a try. What if I shift the samples down to 2bit, this way I can fit in four phases of sample data in just one byte as opposed to two bytes. This would half the sample size again making them a mere $700 hex bytes and under 2k! With this in mind I code a routine to convert the samples to 2bit and then rework the player to play the new 2bit samples and d'you know what... They still sound really good! So that's confirmed it, the gunfight sequence features samples, something the Spectrum and Amstrad versions don't have. Today I've got the fun task of creating some samples for the gunfight sequence. My aim hopefully if there is enough space will be to feature a gunshot and "ARRGGHHH!" sample. So I dusted off my trusty C64, hooked up the Datel Sound Sampler and microphone ready for some sound sessions. Now the trouble with the C64 is there are only about 8 seconds worth of sample time for the full 64K. I'm gonna need at least 8 seconds for the gunshot and cry samples combined! The only way around this is to hack into the Datel recoding software and lower the sample rate the software uses. This will in turn reduce the sample quality and increase the total time available, but it must be done! Anyway, after I'd done that and created a few suitable samples, I shifted them down into 4 Bit data thus halving the size again. The samples are still taking up too much space, about $0E00 hex bytes that's 3.5k - space I don't have. Somehow I need to make them smaller than that if I'm going to be able to use them in the game. My next task is to tweak the sample player to play these sounds, then I'll need to find a way to make them smaller. The colour data for the bitmap alone takes up 2k that's approx $800 hex bytes. It'd be handy to reduce this if possible to give me a little extra space so my task today was to create a much improved cruncher to reduce the size considerably. The data itself contains many repeated characters, so I coded it in such a way that it'll check for matching data bytes and link them together with a single byte repeater. For example a sequence of say 20 bytes each of the colour $0f now only takes up 2 bytes, the first byte holding the number of repeats and the second containing the actual data byte itself. It took a little while to get this fully working due to bugs etc, but once complete it has managed to crunch all the colour data down to under 1K! That's over 50% smaller! Also, the code itself to unpack the data is very small indeed which is pretty handy. This code could be used to crunch sprites and graphics too, so it may well come in handy in the future! My next task will be shorting out the actual samples for the sequence which should prove to be fun! So far the actual source itself isn't allocated into the right locations ready for placing into the game when finished. So this afternoon I spent a few hours re-tweaking the code elements and changing various bits around so the Bitmap, Sprites and Data would slot into the appropriate spaces in memory. I only had a little free time today so I spent this time adding in bird animations for the sky and I coded in the sun and moon sprite routine. This allows me to combine them with the street colours, so now I can feature better dusk, noon and night time scenes. All of which adds more variety instead of the exact same looking scene. Today I've been busy coding in the animation sequence for when the Outlaw shoots you. For this part I used the simple sprite multiplexor I'd coded eariler to allow me to show more than 8 sprites on the screen. What I've managed to achieve is a sequence that when you are shot, sprite bullet holes are fired into the screen along with a spark animation for the Outlaw's guns. Following this I finished off the sequence, by jumping to the routine that handles the blood fill screen animation. All in all it looks pretty nice and I'm quite pleased with it. "Too bad you have to die!" I spent some time today coding in the blood splat animation when shooting the outlaw. Unlike the Spectrum and Amstrad versions I also added in additional code so you can actually shoot him up to 6 times (depending on how many bullets you have), by repeatedly pressing the space to fire in quick succession. Each shot hits the outlaw randomly in the chest/face areas with the little animation blood effects. On testing this I found it was difficult to make out the pixel blood animation so I ended up tweaking the blood sprites further so the splats are now bigger and much better! I also created and added some extra nice sprite effects, but I'm not gonna reveal what they are. You'll find out when you play the game, but all these add much more in the C64 version of the gunfight scene. I did some sprite graphics today that I want to add into the gunfight scene to improve upon the original Spectrum version. I created some animation frames for the gunshot wound on the Outlaw and also blood splat animations. I've also created a sun and moon sprite. I'm removing the sun from the bitmap and I'll use a sprite in its place. This'll allow me to create night time street scenes too! Finally, I created a simple bird in flight sprite which I'll be placing in the background for added animation in the scene. I'll be including these in the code next! I spent this afternoon coding in the timer and condition that determines when the Outlaw draws his gun to shoot you. From the moment he goes for his guns there is a short time in which you must fire. The Outlaw is set to draw his gun the fastest on skill Level 3, while in Level 1 he's slowest and so easier to defeat. I've programmed it in such a way that I can set these conditions from Basic before I call the machine code routine to start the gunfight itself. This part has progressed nicely and I already have a simple gunfight sequence in place that works well. There's still lots to do, what with the main sound effects and additional blood shot animations when the outlaw is hit. I did more coding today on the gunfight sequence, this time I added in a simple routine to handle the shooting of the Outlaw. Basically this allows you to shoot the Outlaw at any time while the music plays. In the original game if the Outlaw has not drawn his gun and you shoot him first you get arrested and lose the game. I've added two conditions for this part. If you shoot the Outlaw, the first condition is set to true. If the Outlaw has drawn his gun the second condition is set to true. With these two conditions I can check the outcome of the gunfight afterwards and place the result in a single variable for checking from Basic. When the gunfight sequence ends and returns to Basic I'll be looking at the result, if it returns 1 then you win the gunfight, if 2 then you drew first, if 3 you lost and if 4 you lost because you had no bullets! Now I need to add in a timer condition during the gunfight sequence itself so the Outlaw will come alive and draw his gun as the music nears the end. "When the chimes end, go for your gun and try to shoot me Gringo! Just try...."
Happy New Year to you all!!! Things have been a little slow on the wild Bunch what with all the work I had creating the special edition of Escape from Arth ( check out the release via www.psytronik.com ) for the Xmas release. Unfortunately I didn't have any extra time to dedicate to the project during this period, but now things are back to normal I'm back working on the Wild Bunch again. Today I started the next phase of coding for the gunfight sequence. I'm going to start off by coding the basic conversion of the Spectrum shoot out first, then I'll be adapting this with extra code for the final C64 version. I spent a few hours laying out various coding segments for handling the sprite multiplexing for the Outlaw and other animation parts I intend to add. I also coded in the new Outlaw sprite display routines for each frame. Finally I added in the shootout music into the code and did a few tests to ensure everything worked ok, fixing a few minor bugs in the process. Before I actually start coding the gunfight sequence it would help if I had all the sprites drawn for the outlaw! Doh!! Soooo, this afternoon was spent grabbing out the original frames from the Speccys gunfight sequence and using Stewart Wilsons handy Sprite Pad tool on the PC to convert all the frames pixel by pixel into yummy C64 sprites... YAY! I also tweaked these frames a little in places and added the multi-coloured underlay sprite so they look a little better now. From where I left off yesterday I have the tedious task of turning my Action Replay street scene code into a fully compilable Turbo Assember one. For this I'm using Total Edit as my IDE which is a cracking free text editor tool ideal for coding. It takes me about 3 hours to go over all the code. The routine is tweaked so it is easy to poke which street colouring I want. I also add in a simple routine which slowly fills the screen with red. This is for when you get shot! I can now start adding all the additional control and gunfight code until the gunfight sequence is complete! Previously I coded a routine using the Action Replay to handle the display of the bitmapped street and showing of the outlaw sprite. I need to convert this into a readable turbo assembler file so I can re-use this as part of the gunfight source. In order to do this I saved the source as a file within a D64 image and use the 64CMD tool to export it as a .prg file. Next I use a handy tool called 6510 dasm that converts a binary C64 .prg file into a readable text assembly file! I loaded the routine into the tool and before my eyes there was all my code in assembly form, excellent! Now all I have to do is convert this into turbo assembler with proper labeling and variable references, my next task! After a short absence due to work commitments I'm back on the project, the next port of call is the most exciting part - starting on the development of the gunfight sequence. I have a few extra additional ideas I'd like to try to improve on it from the original. Like animating some of the background and adding bullet effects across the screen when you are shot and a few other tidbits. Now I want to code this using a cross-assembler on the PC so it'll be easier to tweak and modify until it's just right. Today I spent the evening researching and looking for a decent cross-assembler compiler that I can use to do the job and a few other tools that I'd need for the conversion process. After a few hours I find some tools and a cross-turbo assembler program and test them out, these prove to be ideal! Following Kenz's playtesting and useful comments I spent a little time today tweaking some of the musical journey effects so they are less intrusive to the music that accompanies this part. I did this by using a softer triange waveform in place of the original pulse waveform. Much improved! The Fusion '08 event was a real blast and went extremely well. I finally met up with Kenz who presented me with the 20 pre-order competition CD's all in fully professional colour packaging, lovely! Frank Gasking, Vinny Mainolfi and Andrew Fisher were all there.. The Wild Bunch promo was shown for the first time with much enthusiasm. Top bloke and respected Retro Gamer editor Darran Jones also showed a keen interest in the project and our work which was cool! All in all it turned out to be a great day and I gave Kenz a Promo tape to take home and playtest for some much needed feedback! With all the new tracks in hand it takes me a short time to add them into the game routine. It's time now for a good play test to see how the music works in-game. After a good 30 minute play I have a list of tweaks I need to make, some of the screens are jumping out before the music has finished so it's just a case of simply increasing the delays here. I spend the rest of the day making the odd tweak here and there to the Basic source including stategic elements and level influences that I hadn't originally included. I'd like to make more of these changes during the week if I can get some free time in preparation for the actual promo on tape I'll be bringing along. Kenz, knocked up some cool promo tape labels and new inlays which I already have for the package - it's just a case of mastering the game onto it in time for Sat 19th! What with the Fusion '08 event only one week away, I want to make a few more subtle tweaks and additions for the promo demo so I'm happy with it. These are mainly musical based as at present there is no music for the town menu, or when you challenge and take a character to the Sheriffs office. First up, I have a go at composing a track for the town menu, this will pretty much play in the background during several of the menu sequences. After experimenting with a few styles the best and most suitable that I come up with is nice little mellow track. Click here to download and listen to an mp3 snippet of the track! Next up, are the track sequences for when you challenge a character and take him prisoner. Using the same music track that I created the gun interlude with, I do a shorter version that is in keeping with the Spectrum. I also composed the "Reward" jingle, the "Sheriff laughs" jingle and the "Fine" jingle. These take me a good 3-4 hours to compose, tweak and complete. Once these are done I knock up a couple more jingles for when you have no gun and they run off, and also when they throw a bottle at you and run off. As with the poker sound data, I arrange these so I can tweak and make them play as multiple tracks and add them into my own code. Tomorrow I'll be adding these into the game itself! Today it's back to the Audio side of things as we need some suitable jingles and sound effects for the poker game. Using the USA Music Assembler I spend several hours building up all the sound sequences that I'll need, then tweaking and changing anything that doesn't sound too good. I based a lot of the sounds on the Spectrum version and a couple of my own. Once finish I ended up with 13 jingles, all these tracks need to be arranged so I could modify the data afterwards to allow me to play each sound with a single poke from Basic. As the player can't do mulltiple tracks automatically it's down to me to add my own code to achieve this. This weekend I'm going to have a go at cleaning up and tweaking the poker section of the game. As it stands at the moment it looks exactly like the Spectrum. I'm not going to change too much here, just tweaking the strategy and play elements, adding sound etc. I also want to reprogram the card display routine in Assembly Language to free up some more memory. The first thing I start on is the actual strategy side, making notes from the way the good old Spectrum and Amstrad versions work and tweaking my routines so they're more in line with the original. Once I'd completed this, I then ripped out the Basic routine for the display of the cards and replaced this with a few simple SYS calls ready for the adding of the Assembly Language. Now before I start this I needed to load up Firebirds Graphic Editor again. I'm going to make the cards a bit bigger at the top and bottom with curved edges. This doesn't take too long doing the chars, I only need 6 individual 8x8 chars for the edges. Next I start the coding of the card display, this takes up a good 3-4 hours tweaking repositioning etc. I'm using sprites behind the lettering of the card, then adding edging chars to the top and bottom. I also, have to reposition the text to make enough space for the bigger cards. Check out the screenshots below.... Tomorrow I'll be doing all the music and sound for this part. This evening I try my hand at reprogramming the the Map display so it's in Assembly form instead of Basic to free up some more memory. I opt to create a compressing routine from the actual map display so the chars are compressed into a small chunk of data. This doesn't take very long to code and it's now compressed into a 3rd of its original displayed size. I then code the routine to unpack and show the map, I also use sprites for parts of the yellow background behind the text. The final stage is removing the old Basic display routine and adding a simple call to the new Assembly code. This new routine now takes up around 30% of what it did originally in its basic form, so a good result. I managed to get a bit of free time this evening so I did more work on the Wanted poster. Reloading Firebirds GFX Editor I continued to draw the rest of the characters face then I created the various bits that would make up all the descriptions including, patches, earings, scars etc. I also created some scroll edges to give it a poster feel. Continuing from yesterday I work through the routine adding in the music and sound effects I have so far, the journey sequence takes the longest to complete as it features the sound effects I created for this part... Around 3 hours later after all the tweaking and testing I've got the music playing on the Story section, Map, when you lose/die and during the Journey. Actually the journey sequence is definitely the best part Audio wise so far, during play the SFX and 2 channel music work together extremely well and adds to the atmosphere extremely well so I'm quite pleased with it! I want to tackle the Wanted poster next, as the C64 version I did in 1988 isnt good enough, as you can see from the picture below. I play through the Spectrum version of The Wild Bunch using the ZX Spin emulator and manage to grab a load of screenshots of all the descriptions. From here I load up the old Firebird Graphic Editor on the 64 and start to redraw the Spectrum graphics as 8x8 chars. This will save a good chunck of memory as the original 64 version I did used several sprites which is a waste. Now I have enough material I can finally make a start on the programming side. The first thing I wanted to do was go over the whole Basic routine and look for ways in which I could improve and make it more compact. I dug out the Commodore and Spectrum printed listings for reference so while I'm optimising I can make tweaks to the formulas and strategic elements along the way. I began to work my way through, line by line..... I quickly noticed that being a beginner back in 1988 that my coding wasn't very good at that time. I found many flaws and unnecessary instructions that would need restructuring into more compact and better code. I slowly reprogrammed these parts making the required changes throughout. I also tweak various pokes to graphic and sprite memory into reusable compact variables to improve on this further. The process so far has taken a good 11 hours today. Along the way I've made many notes that I'll need to address later when comparing with the Spectrum version of the listing. There's still more work to do in this area and I intend to remove the various Basic sprite and graphic routines which handle the wanted poster, poker cards, map display etc and I'll be coding these in Assembly Language. This will help to shorten the basic listing and free up some valuable memory for other effects. A very early start today in an attempt to finish off the 2 channel Journey track and source code to handle the SFX channel. I spent a good couple of hours tweaking and fine tuning the instrument sounds, notes and extending the track and managed to finalise the track which loops around 2 and a half minutes. Click here to download and listen to an mp3 snippet of this very track! Now this is complete I loaded in the full track into the CCS64 Emulator and started to look through the USA player source code for ways in which I could adapt it to play the SFX sequences into the unused 3rd channel. It took around 30 mins to work out a method and create the code to handle exactly what was needed. I tapped in the last piece of code and tested it out - yep, works a treat! Now during your travels the 2 channel music will play alongside the spot effects. As a final extra I spent the next 4 hours re-composing a full 3 channel version of the Journey track. This version will not feature in the game, but is instead a special for something else which you'll find out about very soon! Over a couple of evenings I started working on the journey music part, this is the music that will play during your travels between the towns. I want this track to be 2 channels leaving the 3rd channel for sound effects which will be in the form of the Spectrums spot effects, only revamped a little. Firstly I needed to decide on a theme, after listening to a few classic Western film themes on YouTube I decided to go for the theme to 'A Few Dollars More'. I spent a few hours on Friday evening setting out the foundation of the track and opted for a fairly mellow theme as with only 2 channels this would suit best. I spent most of Saturday improving and adding to this track, while creating various effects that I could use within the music player itself. The Dutch USA player doesn't actually have the ability to play SFX, but I'm going add some code that will use part of the channel music sequences to simulate the sounds I need during play. After a lengthy session I decide to tackle the finishing touches of the track and the SFX code tomorrow! Another musical stint today having decided to take on the Game Over theme. I wanted this track to have a sad, mellow feel so opted to do a remix of a theme I'd heard on The Good, The Bad and The Ugly. After a good 4 hours work this morning and trying different styles I've come up with something that sounds just right. I'm quite pleased with how this track has turned out! More music today, this time I recomposed and improved the gunfight interlude jingle that plays on the Spectrum version just before and following a gunfight when you take the gunfighter to the Sheriffs office for identification. This has been much improved from before. Click here to download and hear an mp3 snippet of this track! I fancied tackling some more music for the game, so decided to try and knock up a suitable title theme. I opted for attempting to remix one of the themes from the classic Western "The Good, The Bad and The Ugly". This was composed in the ever faithful Dutch USA Music Assembler. Over several hours playing around with different ideas, I ended up with a track that starts off mellow and builds into the theme. It's not quite finished yet, but it's something I'll come back to later as I want to add a mellow style ending. I started work on The Wild Bunch Gunfight street scene. I used the Spectrum screen that Kenz had sorted out for me on a c64 disk, which I converted onto PC first. Using Congo I converted this straight into multicolour mode to see how it looked in 64 multicolour form at its most basic. As you can see from the screenshot below a lot of work would be needed to enhance this fully! Following this I added in some brickwork effects on the buildings in Photoshop before the initial conversion was to take place in Congo and upon doing this it actually wasn抰 too bad at all, but it still needed a heck of a lot of work to optimise it for the 64. I spent the next 3-4 hours editing and tweaking, but still a lot of work left to do. I decided to spend most of the next day (Sunday 13th) finishing it off. I continued more work on the Gunfight scene today, but before I began I coded a quick routine in the CCS64 emulator and loaded in the existing bitmap to get it to display on the screen. This was saved for later use. I proceeded with the bitmap in Congo doing a good 3 hours more worth of tweaking, changing and playing around with various looks and eventually I managed to get it to a stage I am happy with. Now during the development of the bitmap I had an idea to make the most from the bitmap in which I can change the colours of the building, sky and ground in-game. About 4-5 colours were not used so I colourized each building using any unused colours including purple, green, red etc. Following this I adapted my code so I can use a lookup table and replace the red, green, purple colours with any colour I like. The great thing about this is that I can use the same bitmap, but make the scene look different by mixing the 16 colour palette and building colours. I can also darken the ground and sky to make the scene look like nighttime or dusk for example which will give each Gunfight scene a more varied look! Once this was complete I downloaded Sprite Pad on the PC and started work on the actual Gunfighter sprite. I simply magnified the original Spectrum Gunfighter and copied him pixel for pixel into 64 sprites, but I added an additional multicolour sprite for underlaying behind the Hi-res black outline. This gives the Gunfighter full colour for his face and clothing and I can vary these colours in the game depending on who you are having a gunfight with. This will again add some variety to the scene. 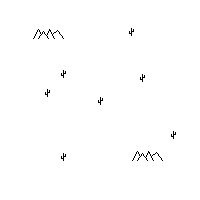 As an additional extra I created a Hi-res cactus for the background. Finally, I bolted all this together into my code and tested it for various scene styles, two of which you can at last see below. I have a few plans for the Gunfight sequence which will add something extra for the 64 version compared to the Spectrum and Amstrad, though I'm not saying any more as that'd spoil it for you. You'll have to find this out yourself when you play the game! The Wild Bunch loading/title bitmap screen has been created! This was developed over a 3 hour period last night. I used the original Hi-res Spectrum loading screen which I opened into Photoshop on the PC. From here I added a rainbow effect on the red sky, I then saved and loaded this into the Congo PC graphics tool, this allows you to convert an image into any Commodore 64 bitmap form. Before I started I had to resize the image into 320x200 pixels for the full 64 screen. Following this I used the dithering feature to convert the rainbow effect and hi-res picture into C64 multi-colours and spent some 2 hours tweaking the rough edges and adding my own colouring to the sun, cactus, and wording. I may come back to this at a later stage to see if I can improve on it further, but for now you can see the results in the screenshot below! The Wild Bunch project website goes live! Kenz produces The Wild Bunch website layout for me to modify and use for the pre-order, news and diary of the game. I have created more music for the game, the jingle which plays when the map is shown. Also the music that plays when you take a shot character or prisoner to the sheriffs office following the gunfight sequence. Kenz finishes first proof version of The Wild Bunch inlay. See below! Wow, very nice! The story so far intro music has been composed. I'm using the Commodore 64's Dutch USA music player tool on my PC running the excellent CCS64 Emulator to handle all the audio music for the game. Click here to download an mp3 snippet of the track! The original Spectrum inlay and tape label is scanned and sent to Kenz for re-designing and development. Using some handy emulation tools the original Spectrum 48k Basic listing is re-printed and my Commodore 64 conversion listing printed for comparison and reworking to ensure the conversion retains the same strategy elements and formulas as the Spectrum. With these in hand I can make any changes to my old source to bring it much closer to the original. It'll also make it easy for me to read through and pick up from where I'd left off 20 years ago! I find my lost C64 work disks with the old Wild Bunch conversion source on! This was no mean feat, what with well over 500 work disks to sift through it took me quite a few days to actually find all the disks with the Wild Bunch source on. There were so many different snippets of source and work data that I've done across many disks over the years that it was very difficult to label and keep track. I use my old Windows 98 PC a CBM 1541 disk drive and PC to 1541 cable and convert the Wild Bunch disks into .d64 images on the PC. Now I can work on this project using the CCS64 Emulator on my modern office PC! The game will be shipped with the more 'modern' colourful cover showing - but if you like the earlier design all you have to do is turn the inlay around! Howdy pardners! Guess what plopped into my inbox today (precisely 1 year after I typed up my last diary entry!!) The almost complete version of The Wild Bunch - that's what! So I put aside some time this month for some SERIOUS Wild Bunch playtesting (it's a tough job, but somebody's got to do it - *grin! *) Armed with a notepad file to jot down important notes about the game and my trusty Colt .45 I set off on my quest to apprehend the Wild Bunch. One of the things I've found about playtesting a game is you end up playing it a LOT - and eventually you get pretty good at it! Over time I've sussed out how the game works and the best way to tackle it. Now, I don't want to give too much away but I'll definitely say it's worth taking notes while you play. The first and most obvious thing you will need to note down is the description of the killer at the start. You will need this for when you encounter him later in the game. Another handy tip when you enter a town for the first time is to go the telegraph office. This way you will find out which town the Pinkerton agent is in. This guy is after you so make sure you don't head for that town next or you will be arrested! The next thing you should do is go to Sherriff's office to look at the WANTED posters. Note down any distinguishing features (missing ears, eyebrows, earrings, scars etc. and the NAME of the person on the poster). If they come moseying into the Saloon you will know WHO you are dealing with when you challenge them to a gunfight. Which leads me onto the next (and most important) new addition to the game - the GUNFIGHT scene! This looks (and SOUNDS) fantastic! The graphics for the gunfight scene look great and there's even some animated birds flying in the distance - a nice touch. An atmospheric tune plays to set the scene and when it stops you have a split-second to go for your guns before your opponent (you see his hands twitch - which is when you should make your move). You can blast the guy several times and are even treated to sampled gunshots and speech at this point!! If you are too slow the screen fills with blood and it's GAME OVER. If you get your timing right you then carry the body off to the Sheriffs office to get your reward - providing you shot the right person of course!! The gunfight scene is pretty tense stuff and I was sat on the edge of my seat waiting for the gunslinger to go for his guns! After a serious session of playtesting I managed to apprehend (I.E. kill) lots of members of the Wild Bunch and I even caught the main killer to complete the game. Even though the actual ending of the game has not been coded yet (it's one of the last things Jon needs to do) I had great fun exploring the game, travelling between towns, gambling (and drinking) in the Saloon and blasting baddies. My feedback notes to Jon were pretty minimal as there really isn't anything wrong with the game! Just a couple of spillong mistooks here and there and I thought some of the colours could be brightened up here and there for the location texts. Apart from that, the game is now both rootin' and tootin'! 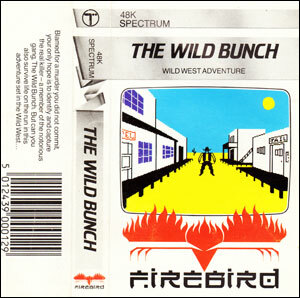 I decided to load up the Wild Bunch today so I could have a proper play and listen to the music in the game. Oh boy, was I in for a treat!! I wasn't expecting the sheer amount of music that's featured in the game - from the nice remix of the familiar Spectrum tune, the fun jingles when you gamble, the atmospheric backing music when you are in town and the SUPERB journey theme that plays as you make your way from one town to another - excellent! My only slight niggle is that some of the journey sound fx are a bit too 'musical' and they interfere with the music that is playing. These should be restricted to simpler spot fx I think (gunshots, horse galloping etc.) Apart from that, great stuff. I even managed to correctly apprehend one of the baddies in the game! The conversion is looking (and definitely SOUNDING) great at the moment - and even though it's currently lacking the gunfight sequence the game is still great fun to play. The C64 version is already looking superior to the original Speccy and Amstrad versions and when it's complete should be something quite special. Nice work Jon! This weekend I attended the Fusion '08 event in Kenilworth (just outside Leamington Spa). The event was great fun - loads of retro computers packed into the venue which you could just pick up and play. Ace! It was also a momentous occasion as it was the first time I had met Jon Wells in person even though we've been working together on various projects for the last 15 years or so! It was great to meet Jon after all this time and we had a good old natter about retro type stuff. Jon bought a Wild Bunch promo along with him so I actually got to play the game on the C64. I was amazed at how complete the C64 conversion was looking. You could pretty much play the game properly - apart from the gunfight sequence which, I must admit, is the one of the highlights of the game so I shall look forward to seeing that when it gets installed. Unfortunately I couldn't properly listen to all the music and spot fx in the game as the event was so noisy! But Jon let me keep the promo tape so I'll have a play when I get back to the Zone. During one of the many email conflabs I've been having with Jon about the game one thing that came up in conversation was the tape mastering. To save a lot of time and hassle The Wild Bunch will be professionally duplicated onto tape by a proper tape duplication company. In order to do this the company needs a CD quality master to use for all the tapes. So the big question was how the flippy-flop do we generate a CD master of C64 loading sounds? For the game Jon will be coding tape mastering software which will dump all the files for the game from disk onto tape - this includes the loader, loading music, loading screen and the game itself. The problem is we don't want to record the master onto tape - we need to record it on the PC as CD quality audio. But how on earth do you get the loading noises from the C64 to the PC without simply sampling the resulting master tape itself (with tape hiss, quality loss and all)? The solution came in the form of a little gadget given to me by my chum Andy 'Thalamus' Roberts many moons ago. It's actually a small box made by Datel that plugs into the C64 tape port. The box has two standard jack leads running from it (one for load and one for save) which allows you to connect a standard tape recorder to the C64 rather than use a C2N tape deck. As an experiment I connected the SAVE lead from the C64 Datel box to my PC audio-in and ran the Sceptre Of Baghdad tape mastering software that Jon wrote. I was hoping I would hear the C64 generating the tape loading noises which I could sample onto the PC - and that's exactly what happened! Lovely pure tape loading sounds were being generated by the C64. In order to test this system I sampled the whole of the Sceptre tape loader, burned the resulting .WAV onto CD and then plugged my portable CD player into the Datel box via the LOAD lead. I then hit Shift/Run Stop on the C64, pressed PLAY on the CD and ... It worked!! The tape version of Sceptre Of Baghdad loaded perfectly from CD. The only thing I had to remember to do was to quickly press SPACE when the 'OK, program found' message appeared as the C64 usually stops the tape motor while waiting for you to press a key to continue loading. So that's the tape mastering problem sorted! After a bit of a brainstorming session me and Jon came up with the idea of giving away a gift to 20 people (picked at random) who have pre-ordered the game. The prize we decided on was a specially produced soundtrack CD featuring music from the C64 version of The Wild Bunch along with soundtracks from other C64 Western themed games. In order to do this I waded through the HVSC collection looking for Western themed tunes and then put together a list of possible tracks for the CD. As it was a bank holiday weekend this weekend I had a bit extra time on my hands so I spent some time recording music from C64 Western games in the Binary Zone studio (from a real C64, of course!) and started assembling the tracklisting. I left some room on the CD for soundtracks from the Wild Bunch game that Jon would be producing at a later date. I also had a doodle with the CD cover artwork today which will be based on the Wild Bunch tape inlay artwork. My next job was to airbrush the front of the inlay to change the yellow border from the Spectrum version to a red border to show it's a C64 game. Using the C64 Firebird game 'Arcade Classics' as a guide I noticed the bottom section of the border on the C64 game was still yellow but the top section was red so I carefully airbrushed the top section of the Wild Bunch inlay to match. I then lifted the COMMODORE 64 / 128 text from the Arcade Classics inlay and placed it onto the Wild Bunch inlay. I then produced a red box to go on the spine of the inlay to show that it is the CBM 64 / 128 version of the game. To finish off the inlay I retyped all the instructions and added C64 loading instructions. I also changed the credits to suit this new version of the game. And voila! The C64 inlay was complete. I then printed a test inlay, took a few photos of it in a tape box and emailed them to Jon for his feedback. I began working on the Wild Bunch inlay today! My first job was to remove the creases where the original tape inlay had been folded. This took a good few hours as I had to rebuild the pictures of the cowboys shown in the background on the inlay. I also had to carefully restore the sky and ground so it all blended together nicely. Ironically, this was the hardest part of the inlay to produce and you probably won't notice any of it as the inlay will be folded once again when it gets put into the tape boxes! After that I removed any remaining blemishes, creases and small marks from the inlay and then set about getting rid of the two holes from the back of the inlay. These were the holes that the 'tape lugs' on the tape box went through to keep the tape secure in the box. Nowadays you can get clear tape boxes with no lugs (which I think look much nicer) so I got rid of the holes. This meant more artworking to restore the background images and I also redid the screenshots as one of the holes was punched right through where the screenshots are illustrated on the inlay. I used nice cripsy clear screens from the emulator on the inlay which look much sharper than the ones on the original Spectrum inlay. I received the tape inlay scans from the Spectrum version of the Wild Bunch from Jon today so I set about creating a tape inlay template in PhotoShop to ensure my artwork prints at the correct size. I then dropped Jons scans into the template and worked out what needed to be done to the artwork. Jons timing was perfect as it's Easter in a few days which means I'll have a bit of extra time to work on the inlay artwork. 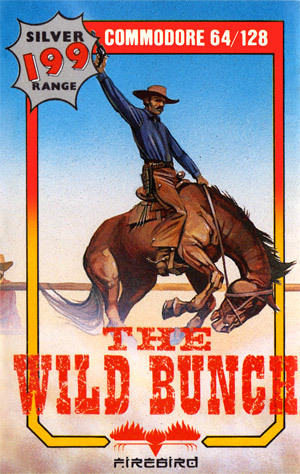 I received a very interesting email from Jon today which mentioned he was resurrecting his old conversion of the Speccy / Amstrad budget title 'The Wild Bunch'. I was rather excited by this news as I used to LOVE that game on the Speccy as it was one of the early Firebird budget games I bought. Anyhoo, Jon mentioned he would like to produce a special edition of the game on tape complete with authentic artwork so I offered my photoshop services and requested that Jon send me hi-res scans of the inlay to have a fiddle with. It looks like me and Jon are now collaborating on a C64 project after all these years. COOL! So there I was minding my own business when **SHAZAM! ** an email arrived from my good C64 chum Jon Wells. I had tons of fun working with Jon (along with Alf Yngve, Paul 'FeekZoid' Hannay and Jason 'TMR' Kelk) on various C64 projects back in the 90's so it was great to hear from him again after all this time. I was also really pleased to hear he had been working on a new C64 release - the Sideways SEUCK Project - so I crafted a little banner for him in order to help promote it. But that was only the beginning ... ! Now Available - Jon Wells' Sideways SEUCK for the C64!